Few video gaming adaptations of the Games Workshop turn-based universe seem to work out as well as their dice centred brethren. Blood Bowl 2, however, does seem to indicate that things are heading in the right direction. 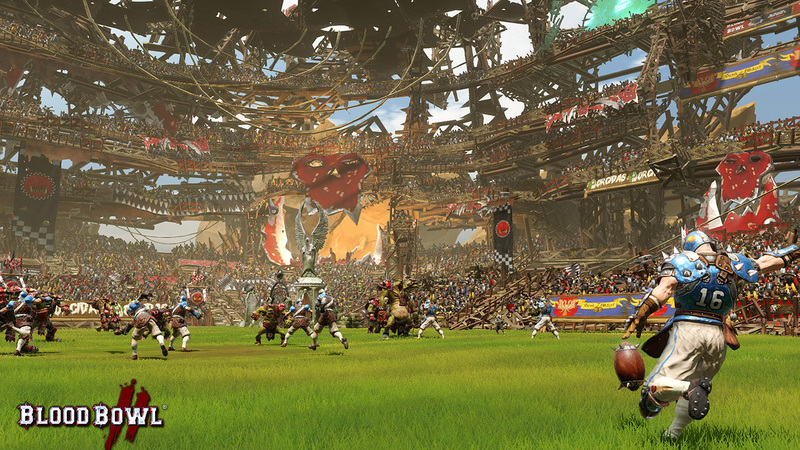 Based on the board game by Games Workshop, Blood Bowl 2 is the sequel to the 2009 release. Set in a fantasy world where you take the reigns of a flagging Blood Bowl team, you’ve got to adapt to the violent sport in an effort to guide the team to success and survival. Blood Bowl 2 also uses a new engine and new graphics, making for a crisper and much more appealing iteration, all of which is welcome. The career introduction features an extended viewing of the game’s commentators, Jim and Bob. Their appearance provides some context going into each game, and some entertainment. But they do tend to go on a bit. I found myself skipping many of their scenes. But they also provide commentary during the match, but this can be sporadic at times. But the gameplay itself is much better than the original 2009 release. Turn-based play has a reputation for being drawn out at times, but here it’s relatively easy to sweep through your team, dishing out commands in an effort to stop the opposition from scoring or to push forward and get a valuable point. Some interesting stadiums, though it could do with more. Multiplayer is one of the great strengths of Blood Bowl 2. Though the AI of the career mode doesn’t throw in the towel, it isn’t exactly challenging once you gauge the strengths and weaknesses of each opposing team or race. But multiplayer provides the challenges of facing a human opponent. Win or lose, the matches can be thoroughly entertaining. Though if you happen to lead by a considerable margin (3-1), your opponent can sometimes opt to sack it and walk away, resulting in a frustrating outcome for what would otherwise have been a rewarding victory. However, if both players stick at it, a match can turn into the brain-stormingly violent equivalent of chess. And win or lose, those games are worth it. Graphically, everything is better this time round, but with other ‘sports’ titles pushing the graphical boundaries, Blood Bowl tends to look a little behind the curve. The camera angles can also be frustrating and disappointing, providing little flexibility during play. The dice can be deeply unforgiving. I’m not sure if the attempt at replicating random chance has led to a cube-shaped version of the Terminator – ready to ruin your day at a moments’ notice – but there’s definitely room for improvement. The biggest let down for me is how strictly the game adheres to the board game original. Play can be slow at times, especially in the run up to the match itself, as you watch Jim and Bob talk about the forthcoming match and your current run. Despite the option to skip this, which is most welcome, there’s a lot of discussion going on. And though it can be great for providing context or humour, their appearance both before and after a match does tend to wear somewhat. As Blood Bowl 2 doesn’t possess the fluidity of other ‘sports’ rivals it does stutter at times, a casualty of turn-based play. And it is hard to feel truly energetic when playing against the AI. Though it’s certainly different and that sets it apart from other titles. Hopefully, any future iterations of the series will be more flexible when it comes to adapting Blood Bowl onto consoles. Though there are areas where Blood Bowl 2 needs to head to the gym and get in shape, its alternative offering of ‘sport’ is a breath of fresh air compared to the likes of FIFA, NBA, and PES. And that makes it stand out from the competition for all the right reasons. Besides, what other game provides the opportunity for an ogre to pummel an opposing player. Next Post Halo 5: Guardians – Hail To The King? Previous Post Destiny: The Taken King – A Story Redeemed?